For safety, total privacy or a complete new look, try quality NewDecor self adhesive films. 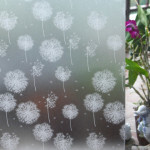 Window Film is available in a range of designs and sizes. Depending on design, the lengths of rolls 1.5m – 3m and width 45cm – 67.5cm are sold as individual rolls, at a suggested price of $22 to $40 including GST. Larger rolls of 15m-30m are available for some designs and most stores will cut by meter in store, so make sure you have the measurements of the window or area you wish to apply to. DIY glass decoration with integrated design patterns that are easy-to-apply.